Timing is everything, they say, in sports as in life. And the timing could not have been better for a visit to McGill from Detroit Red Wings head coach and McGill alumnus Mike Babcock (BE’86). 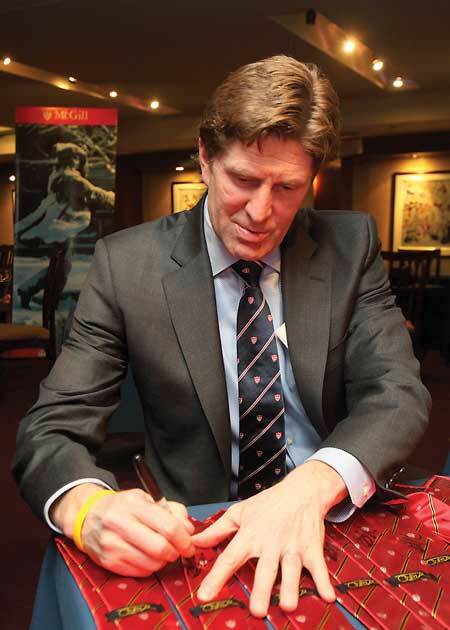 Just hours before Babcock extolled the virtues of hard work and preparation at an event organized by he McGill Alumni Association, the team he patrolled the blueline for from 1983-87 was named Canada’s No. 1 college hockey squad. Timing is everything, they say, in sports as in life. And the timing could not have been better for a visit to McGill from Detroit Red Wings head coach and McGill alumnus Mike Babcock (BE’86). With his Wings making a rare trip to Montreal to play the Canadiens, Babcock showed up in a navy blue McGill necktie and gave a passionate speech before a packed crowd of 250 McGill graduates in an event billed as “An evening with Mike Babcock,” organized by the McGill Alumni Association at the Mise au Jeu restaurant in the Bell Centre, Tuesday. Meanwhile, just hours before Babcock extolled the virtues of hard work and preparation, the team he patrolled the blueline for from 1983-87 was named Canada’s No. 1 college hockey squad. According to Canadian Interuniversity Sport’s weekly Top 10 rankings, the McGill Redmen are the new team to beat in men’s hockey. The Redmen (17-2-2) received 12 of 17 first-place votes and 158 points from the national media panel to take over at No. 1 from the New Brunswick Varsity Reds (14-5-2), who had earned the top spot in each of the first 10 polls of the season. The reigning University Cup champions fell to No. 3 behind the Western Ontario Mustangs (18-2-2), who moved up two positions. McGill, which had been ranked second behind UNB each of the past eight weeks, moved up to No. 1 for the first time since February of 2006. The Redmen edged Carleton 1-0 in a shootout Friday night in their lone outing of the past week, and are set to battle Ottawa (12-10-1) and Carleton (12-7-3) this weekend. But the news wasn’t all good on the hockey front. The defending national champion and perennial No.1-ranked Martlets dropped to No. 2 this week after suffering only their second loss of the season, a 4-3 shootout decision to the visiting Carleton Ravens, on Jan. 22. It would have marked the first time ever that both McGill hockey teams held the No. 1 ranking at the same time. The Martlets, who are 16-1-1 against CIS teams this season, will head to the nation’s capital looking for revenge this weekend. They play the Ottawa Gee-Gees and Carleton in back-to-back games, Jan. 27-28. With files from Earl Zukerman, McGill Athletics & Recreation.